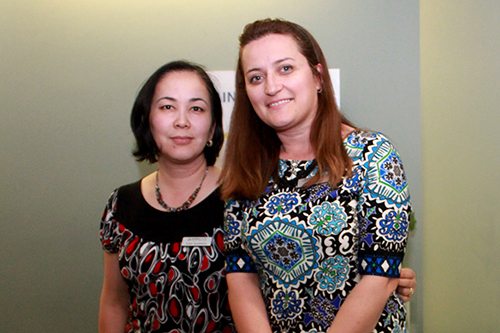 Gulya Taubaldieva (left) with DCC receptionist, Fitore Bajraktari, at our Annual General Meeting on May 10th, 2017. Gulya Taubaldieva was born and raised in Nukus, Karakalpakstan, Uzbekistan; a country that was originally under the USSR until it became an independent in 1991. As a young adult, Gulya pursued advanced education by completing her Master’s Degree of Biology and Ecology in Uzbekistan. While in university, Gulya worked as an Education Project Administrator for two years and spent her spare time with her family, friends and church group. Gulya’s journey began in 2002 when she met and married her husband Bob: “The leader of my church group knew my husband and introduced me to him through email. He told my future husband, ‘She is educated, beautiful and will make a good wife,’” Guyla said with a laugh. Bob and Gulya remained in contact through phone and email for five months until they met in Russia. “He proposed the minute we met. He looked at me and said, ‘You are the one, so why wait?’” said Gulya. Two months later, Bob and Gulya wed not knowing that their life was going to take a rapid and unexpected turn. Two-years prior to meeting Gulya, Bob had fled his home country in fear of prosecution due to his faith. He came to Russia in search of refuge and freedom, but found little of it until he met Gulya. After Gulya and Bob wed, they returned to Uzbekistan and Gulya found out she was pregnant with their first child. A few weeks later, they were both told to apply for protection under the United Nations High Commissioner for Refugees, as their safety was about to be compromised. Within a couple of months the UN offered Gulya and Bob two countries: Canada and the United States. Seven months after beginning the process it was time to leave for Canada. “The UN bought us plane tickets. We didn’t get to choose where we would end up in Canada, but when we found out we were going to Calgary, Alberta, I was thrilled,” Gulya said. “They were so friendly. I was relieved and happy,” Gulya said. Members of the Calgary Catholic Immigration Society met Gulya and Bob and escorted them to the centre where they lived for the next 20 days. Gulya with Distress Centre employees, Fitore Bajraktari, Sarah Xu and Edwin Morales (back), helping out at our Lend An Ear Breakfast on September 22, 2016. In October of 2015, Gulya enrolled in the Office Administration Program (OAP) at Calgary Immigrant Women’s Association (CIWA). It is a six month program and included one practicum work placement. In January of 2016, Gulya began her practicum at Distress Centre Calgary (DCC) where she assisted with reception and performed administrative duties. After graduating, Gulya decided to continue volunteering at DCC one or two days a week.